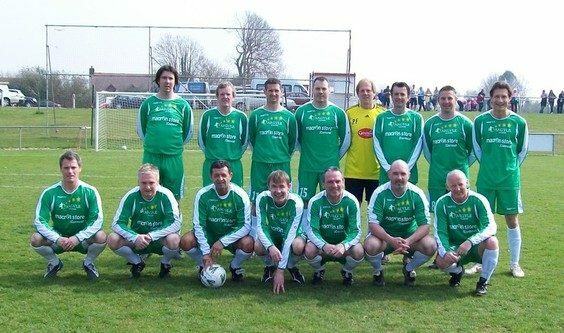 Argyle Legends were made to work hard by a very good Elburton Veterans side before eventually running out winners by 5 goals to 2. The Legends gave debuts to both David Byrne and Chris Hargreaves and welcomed back Tommy Tynan after a lenghty absence but were without the services of Gordon Nisbet, still not quite 100% fit following a recent back operation. Included in the squad was Philip Oke winner of an auction to play for the Legends. The game sponsored by Beacon Electrical kicked off in bright sunshine in front of a healthy crowd at Haye Road and saw the Legends make an encouraging start with Chris Hargreaves almost making a dream debut, his shot in the 3rd minute going inches past the post. In an enthralling opening the hosts came close to opening the scoring in the 6th minute when Roger Bonaparte hit the crossbar with a tremendous effort, the ball also hitting the goal line before being scrambled away. With David Byrne prominent on the wing the Legends were having most of the early possession with Tommy Tynan having his shot saved and Kevin Nancekivill shooting just wide after 16 minutes. Elburtons' front two of Harvey and Bonaparte were a lively pairing keeping Ryan Cross and Darren Tallon busy with their intelligent running. Bonaparte in particular was proving a real handful for Darren Tallon and Lee Harvey powered a header just over the bar in the 21st minute. The Legends went ahead in the 22nd minute with a cool finish from Nancekivill. The Legends were playing some good football with Darren Garner and Mark Rowe prominent in midfield and went 2-0 ahead in the 29th minute when Chris Hargreaves finished off a flowing move. The hosts were not to be denied and pulled a goal back in the 31st minute when Paul Smith netted from the penalty spot after Darren Tallon was adjudged to have fouled Bonaparte just inside the penalty area. Three minutes later Kevin Nancekivill was brought down in the Elburton penalty area and Tommy Tynan restored the legends 2 goal advantage from the spot, coolly sending the keeper the wrong way. In the 36th minute Darren Garner made it 4-1 to the Legends when he crashed the ball home following another fine move involving Hargreaves, Byrne and Rowe. There were no more goals before the interval. The Legends made three changes for the second half with Marcus Crocker, Mark Damerell and Spencer Cooper replacing David Byrne, Leigh Cooper and Kevin Nancekivill. Elburton started the second half on the offensive with Bonarparte firing just wide in the 47th minute and Peter Foxwell saving well from Harvey in the 49th minute. It came as no surprise when the hosts reduced the arrears in the 51st minute, scoring direct from a corner to make it 4-2. Another goal to the home side at this stage could have made it a nervous last 30 minutes for the Legends but the experience of Hargreaves, Garner and Cross meant that goalkeeper Foxwell was rarely troubled. In the 65th minute Tynan got his second and the Legends 5th goal with a close range finish following a great cross from Spencer Cooper. Following this goal the Legends brought on avid Argyle fan and auction winner Philip Oke to partner his idol Tommy Tynan, replacing the injured Darren Garner. There were no more goals and a thoroughly entertaining game ended in a 5-2 victory to the Legends. The Beacon Electrical Man of the Match was Legends Chris Hargreaves. and auction winner Philip Oke. After the game menengitis sufferrer Archie Barton was presented with a signed Plymouth Argyle ball. Funds on the day were split between Archie and Elburton Villa.